1. Preheat oven to 220 degrees Celsius. Line a baking tray with baking paper. Boil the potatoes in salted water until tender. Drain, then return to the pan and place over a low heat for 1 minute to drive out excess moisture. Mash the potato, using a ricer to remove all the lumps. For a smoother finish, push the mash through a fine sieve. 2. Return the mashed potatoes to the pan over low heat, then blend together with butter, nutmeg, salt and white pepper. Spoon the mashed potato into a large piping bag fitted with a star tip. Pipe into swirls on lightly greased baking paper. Bake for 10-15 minutes or until golden and crisp at the edges. 3. Meanwhile, place spinach in a colander in the sink. Pour boiling water over to wilt leaves, then cool under running cold water. Drain well, and squeeze dry. 4. Arrange spinach leaves over chicken and top with Camembert cheese, then roll up to enclose. Lay a slice of prosciutto on the work surface, then place chicken on top and wrap to enclose the filling. Repeat for remaining prosciutto and chicken thighs. 5. Heat oil in a large non-stick fry pan over medium-high heat. Cook chicken for about 5 minutes until browned on all sides. Transfer to a baking tray and cook in the oven for 8-10 minutes, or until chicken is cooked through. 6. To make the wine sauce, re- heat the fry pan with a dash of oil. Melt butter on medium-high heat. Fry the sage leaves until crisp. Remove leaves and set aside. Fry the onion for 2 minutes or until soft. Add garlic and cook for 1-2 minutes. De-glaze with white wine, whilst scraping the bottom of the pan. Cook for 5 minutes or until reduced by half. Add the stock and stir in cornflour to thicken the sauce. Add sugar, cook stirring for 1 minute or until sauce thickens. Season to taste. Strain and keep warm. 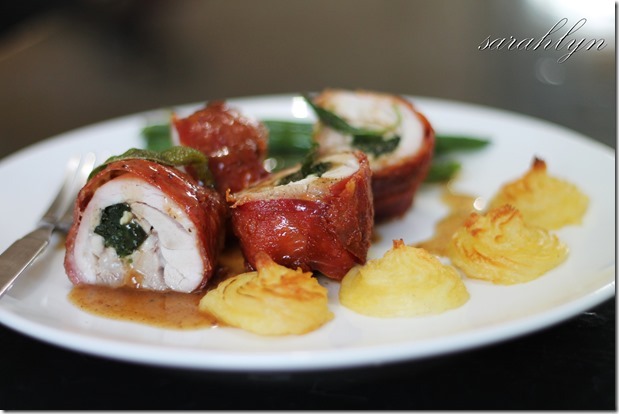 For serving: Cut chicken in half and place on serving plates with the potato rosettes and beans. Drizzle with wine sauce. Garnish with sage leaves.